You can make individual appointments with any career counselor for career guidance and exploration, resume and cover letter critiques, mock interviews, and other career-related topics. You can also meet with one of our Career Peer Advisors for resume/cover letter critiques and use this opportunity to learn about their own experience with Luskin, internship search, and professional development. 1. Select the calendar for the counselor/peer advisor you want to meet with. CareerView is specifically for Luskin graduate students and alumni. It includes full-time and part-time positions, internships, and applied policy or planning research projects that are referred to us by alumni, faculty, staff, and employers. Access CareerView by registering for a new account. Handshake is a campus-wide platform that connects Bruins with internships, jobs and career opportunities. Use Handshake to find workshops, events, other career development programs hosted by the UCLA Career Center and to schedule counseling appointments with Career Center advisors. The University of California system and UCLA has licensing to access a variety of business databases to help students research companies for academic use. The following are ones that may be useful for students to learn more about specific organizations. Creates custom lists from more than 30 million US business profiles filtered by geography, industry, public/private ownership, employee size, annual revenue, and more. The database also includes more than 2.3 million job listings, 1.1 million healthcare professionals, 2 million new businesses, and much more. Users must be connected to UCLA VPN in order to access the database for free. Information on multinational firms operating around the world. The database may be searched by country, state, keyword, zipcode or postal code, industry code, revenue, and the number of employees. Users must be connected to UCLA VPN in order to access the database for free. Get reviews of companies and their management from current and former employees. Resource for job/internship search throughout the US and abroad. Obtain expert advice on CV, resume, work permit & visa requirements for work abroad. Identify companies who have submitted H1B visa applications. Log-in Handshake, click on ‘Career Center’ and select ‘Resources’ to access UCLA subscription. Database to help students find funding to support unpaid internships and internship fellowships. Most deadlines are between August and March. Prospective applicants should plan ahead. Graduates pursuing careers in public service and are employed by a government or not-for-profit organization may be to qualify for loan forgiveness. Graduate school is about fine-tuning your skills to take your career to the next level. Our team works with students to identify career options, prepare for their internships and employment upon graduation, and build professional networks through workshops, panels and other development opportunities. The resources below are compiled to help students towards a successful internship and job search. Tips and resources to help you towards a successful internship and job search. Dot Org Jobs Non‐profit jobs: Fundraising, project management, etc. 1. Your living wage – the minimum income requirements you need in order to cover basic requirements such as rent or mortgage, utilities, groceries, and car/transportation. 2. Your current worth – research pay scales for individuals at your current skill and qualification level, position, industry, location, and business climate. 3. Top of the scale – for your position, industry, location, and business climate. Below are some resources to help you determine your base. Once you have determined your worth based on the job market and your salary requirements, decide on an amount that you want and what you’ll accept before starting negotiations. See the UCLA Career Guide: Negotiating a Compensation Package for the monthly worksheet and more detailed tips for negotiating salaries. Information based on salary surveys, salary and compensation information and analysis. Includes evaluations for job offers or raises, and salary in your current position. Statistics on targeted position or potential career path, including educational requirements, national salary levels, working environment, and more. Compare what positions are paying in your choice of industry and location based on years of experience and education. A leading provider of online compensation data, including salary comparison, serving both individual employees and HR/Compensation professionals. Enables students and alumni to estimate anticipated salary levels for several occupations, factoring in career titles, geographical location, education, and more. Locate national professional associations by occupation or industry served. Tips and resources for developing your networking/informational interviewing skills and elevator pitch. Networking is one of the most important skills that job seekers need to master to be truly effective in their job searches. It has been reported that upwards of 60% of all jobs are secured through networking. A well-developed career network can provide support, information and job leads. There are a number ways to develop a career network – joining professional associations, attending industry-specific social events and conferences, setting up informational interviews, or even just meeting colleagues for lunch. Getting involved with your alumni association, participating in volunteer opportunities and actively utilizing LinkedIn are additional ways to expand your circle. On-campus networks: Get involved to meet people with similar interests, different backgrounds, inspiring life paths and networks of their own. Consider joining student organizations, get to know your faculty advisor, and attend lectures and talks within your department, Luskin, and across campus. Mentoring programs: Consider applying to the Senior Fellows program. Professional associations: Become a member of professional associations for your field and concentration, consider attending conferences and local meetings. What do you enjoy most/least about the work you do? What personal and professional characteristics do you feel are important to this position or industry? What trends and opportunities are developing? What would be the best types of stepping stone positions I could take in order to gain the experience I need to do this job well? What type of courses or education would you recommend? What professional associations have you found useful? What advice would you give to someone entering the field? After the informational interview, write a thank you letter and contact anyone you were referred to for more information. When attending networking functions, it is helpful to have your “elevator pitch” or “sound byte” prepared. This is a 20‐30 second statement that succinctly summarizes who you are, what you do (and what the value is), what makes you unique, and your immediate goals. Imagine that you are standing in the elevator with a potential employer or business contact and you have 20 seconds to make an impression. What would you like them to take away from the interaction? What are your key strengths and positive qualities? Why are you interested in this company or this industry? How do you work to meet the types of problems/challenges facing this industry or position? What unique contributions will you make? Example: My name is Sarah. I’m a community builder and housing developer with GIS training. 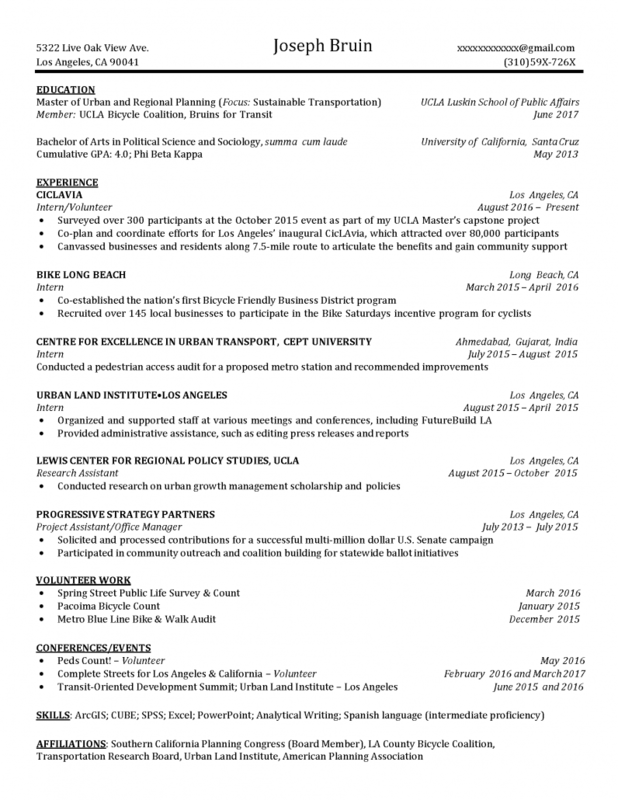 I’m currently pursuing my master’s degree in urban planning at UCLA. I’m bilingual and my experience includes designing multi-purpose residential units in small communities. Not only do I hire local talent, I recruit community leaders as volunteer project co-managers so I have the input of the neighborhood. Tell me about what you What has your experience been like working there? Would you mind telling me about the professional atmosphere at “x” company? What do you see as the current trends in your field? What would make someone the ideal employee for your company/industry? What can you tell me about “x” firm? Tips and resources for preparing your resume, cv and cover letter. A resume is a forward-thinking advertisement – it is marketing your successes and value to your target audience/department and not just describing tasks that you performed on a daily basis. It is NOT a laundry list of past responsibilities; it is promoting your transferable. Prove that you added value by showing results whenever possible. Demonstrate that you are contribution-focused. Update your resume regularly – make sure it is current. Include new events, awards, projects, responsibilities. Be concise and avoid redundancies. Consolidate related bullet points when possible. Every word counts. Are you expressing your point as concisely as possible? Watch for consistency throughout each section of the resume both in terms of format and content. For example, if the months are spelled out, then make sure all of the dates listed follow this same format. For additional sample templates and action verbs, see the UCLA Graduate Student Career Guide. 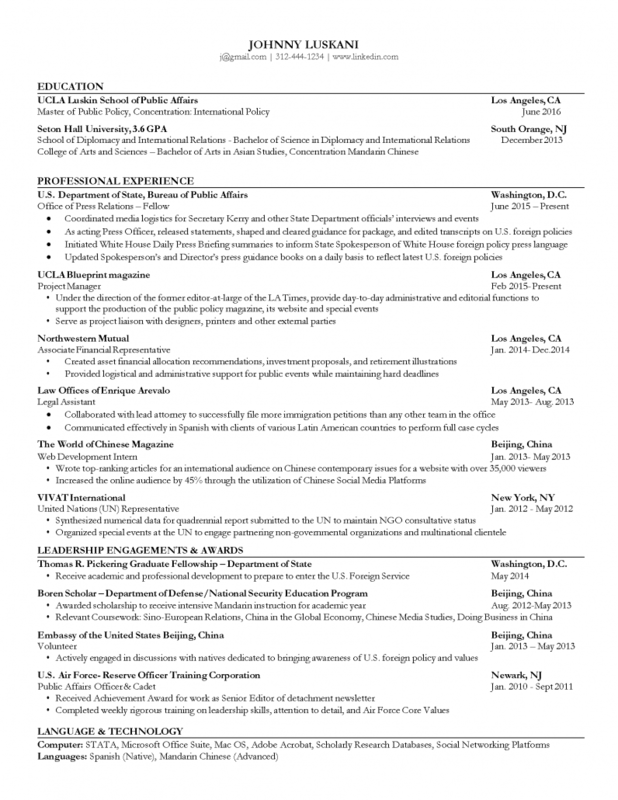 A CV is primarily used when applying for academic and research positions. It may also be used as part of the fellowship and grant application package. 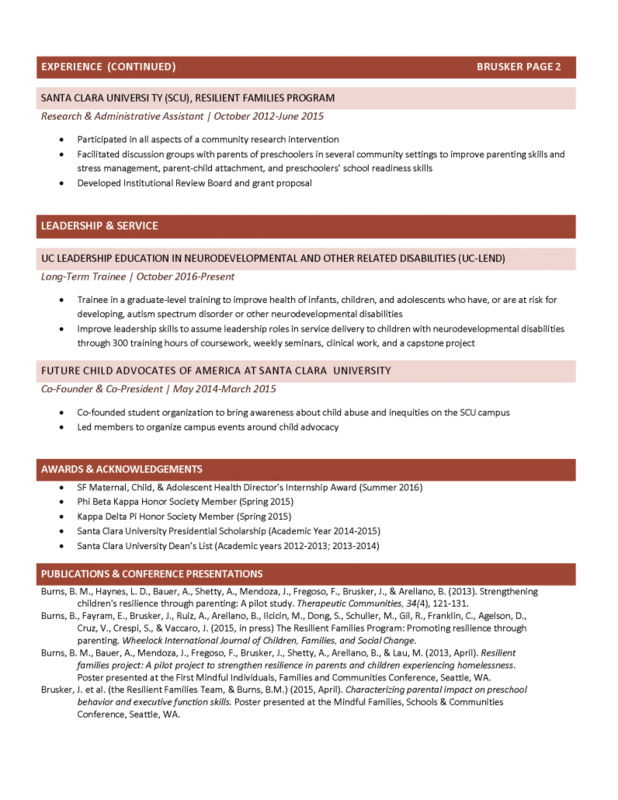 A CV should include your academic background, teaching and research experience, publications, presentations, awards, honors, affiliations, among others. 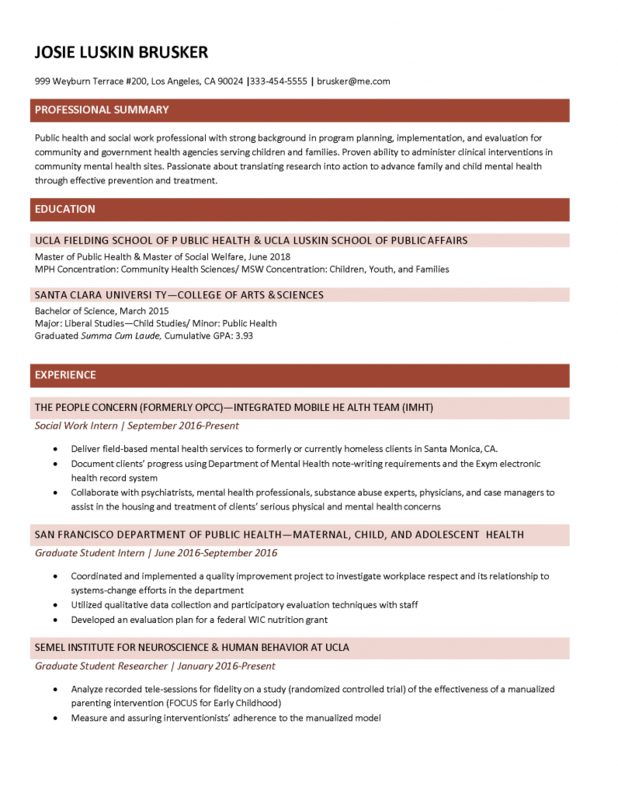 For additional information and CV sample, see the UCLA Graduate Student Career Guide. See section for PhD students for additional resources. Well‐written cover letters/emails are an extremely important part of the job search process. They are your opportunity to grab the employer’s attention, highlight relevant skills, experience and education, and illustrate what you know about the employer and the position. Cover letters also provide an opportunity for you to showcase your excellent writing and communication skills. Know your Understand the value that you bring to the organization. What relevant skills, experience and education do you want to highlight for this particular position and organization? Know your Who will be reading this letter? What skills will they be looking for? Research the company. Show familiarity/understanding of the department and why your background would be of value to the role that you’re targeting. Customize/personalize your letters. 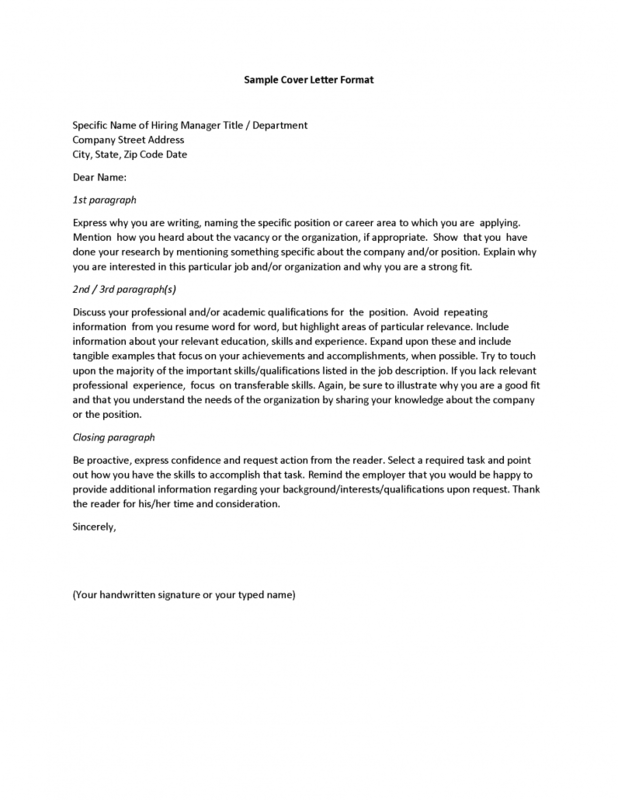 Tailor EVERY cover letter you write to the organization and specific position. Always address the letter to an individual, not “to whom it may concern” unless you are unable to find this information. Use “Dear Hiring Manager” when the name is not available. Be positive and contribution-focused. Focus on what you have to offer. 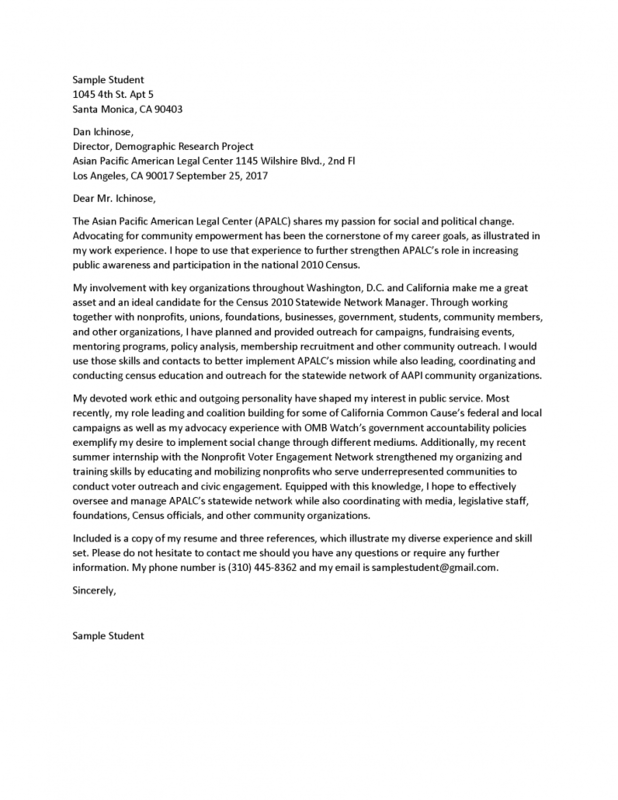 Be concise – in most cases, cover letters should be no longer than one page. Proofread! Mistakes or typographical errors convey a lack of attention to detail. Use action verbs when possible. Clearly express why you are a strong fit for the position and how you will contribute to the organization. Tips and resources to help you prepare for your job and internship interviews. Prepare for your interview by getting your career goals in focus, identify your main strengths related to the job, and gather specific accomplishments to back up your skills. Research the organization and review in advance the most common interview questions and behavioral interviewing techniques. Find out the dress code in advance and dress appropriately. Here are some guidelines. Practice by yourself, a career counselor, or with a friend. Use InterviewStream to practice interviewing anytime from a computer or mobile device and access over 7,000 general and industry-specific interview questions. Log-in to Handshake, select Career Center from the toolbar, then Resources. For additional tips on successful interviewing, see the UCLA Career Guide and 10 Types of Interviews (and How to Ace Them). First impressions count so be on time or a little bit early to allow yourself time to relax and feel comfortable. Send the right body language by relaxing and being yourself. Sit erect, use gestures if they come naturally, and maintain good eye contact. Speak clearly and concisely. Keep your responses specific. Ask for clarification if needed. Let the interviewer set the tempo but be prepared to take the initiative if you’re not getting the opportunity to make your points. Ask relevant questions to increase your understanding of the job. Close positively, end the interview as you started it by emphasizing your main strength. Write a thank you letter or email to all you interviewed with. Add any pertinent information you might have left out of the interview and reiterate your interest in the job. See a sample thank you note. Keep an organized log of names and contact information along with interview dates. Take any additional steps suggested by the interviewer, (completing an application, talking to others, sending a transcript or portfolio). In addition to the in-person interview, it is common for organizations to conduct a phone or video interview as a first-round screening to determine if you’re a fit to come in for a full interview. You prepare for it just as you would for an in-person interview with some key adjustments to accommodate technology. Rehearse. Ask a friend or colleague to do a mock interview with you so you can feel comfortable responding as you would in an in-person interview. Prevent interruptions. Silence phones and find a quiet place to conduct the interview. If you share a living space, post a “Do Not Disturb” sign. Test your Skype/video platform, headset, and internet connection beforehand. Use your notes. This is one main benefit to phone or video interview. “Dress” for an interview. Putting on smart, interview-style clothes before your scheduled telephone or video interview can help you to focus and get into a professional mindset. Smile. If you make yourself smile during the conversation, you physically become more relaxed and, as a consequence, your voice will sound more confident, friendly and assertive. You will come across much better when speaking. Lighting and surroundings. Pay attention to lighting and glare when you are doing a video interview. You do not want the interviewer to be distracted from your responses. Why do you think you’ll be a good fit for this company? What are your qualifications for this position? What personal and professional qualifications do you possess that have allowed you to be successful in your field? What specific strengths did you bring to the table? What has been your most important work-‐‐related contribution? What were your most significant accomplishments in your last job? What is the most important thing you’ve learned from your previous experience that will enable you to be successful in your next position? What personality traits do you possess that you think are necessary to succeed in this field? What is the most significant improvement in (your field or area of expertise) that you have achieved in the last year? What can you do for us if we hire you? Why did you attend this particular school? How does your degree prepare you for a career in this industry? What natural skills do you possess that made this the ideal academic and career choice? How will your education help you to excel at a job here? What qualifications do you have, beyond your academic achievements that will enable you to excel or succeed within our company? Do you think your grades are a good indicator of your ability to succeed here? What other types of positions and companies are you considering right now? What are your long-range and short-range goals and objectives and how are you preparing yourself to meet them? What rewards are the most important to you in your chosen occupation? What expectations do you have in terms of earnings in five years? What qualifications do you have that make you think you will be successful in this field? What do you think it takes to be successful in our organization? In what ways can you contribute to our organization? Describe the relationship that should exist between a supervisor and employee. What factors are most important to you in your job? Do you prefer a small, medium, or large organization? What criteria are you using to evaluate the organization for which you want to work? Understands the Mission: What makes you optimistic that our organization will continue to Thrive? Motivated to work for our mission: Outside the role you’re interviewing for, why are you interested in being at this organization? Participates in a community of culture: Tell me about a time that you’ve felt the most motivated or successful. Why? Prioritizes a mission over self-interest: What is something you’ve worked hard towards in the past for no other reason than you were passionate about it? Cares for others: What’s the most compassionate thing you have done for someone else in the last 6 months? Encourages participation: Tell me of a time you championed someone else’s work? Listens and communicates: Tell me about a time you disagreed with someone. How did you resolve it? Bold: Tell me about a time you’ve done something you consider risky in either your personal or work life? Imagines the ideal outcome: What’s one big problem in the world that you are passionate about solving? How? Resourceful: If you woke up tomorrow and didn’t have to worry about money for a year, how would you spend your time? Curious: When is the last time you had a big change in perspective? Who changed your mind? Owns and learns from mistakes: What is something that’s challenging for you that you’re still working on? Optimistic: Tell me about a time something important to you didn’t go as planned. What did you do? What do you see as this position’s primary responsibilities on a daily/weekly basis? How, if at all, do you see these responsibilities changing over time? What do you feel are the most important responsibilities of this position? What are some additional aspects of this position that are unique to your company? What are this company’s current challenges? What do you view as this company’s greatest goals and missions? Has this company experienced a downsizing at any time in its history, and if so, when? What do like the most about your position here? What is the work environment like day to day? Is there anything else I should know about this company? Are there any aspects of my skills or background that you would like to hear more about? How would my performance be measured and how is successful performance usually rewarded? Can you describe your organizational culture? Where does this position fit into the organization? What kind of person are you looking for? What problems might I expect to encounter on this job? Tell me about promotions and advancement in this company. What are your expectations of the person hired for this position? What are the three most significant things that need to be accomplished in this position in the first year and what do you foresee as the major hurdles? InterviewStream is an online platform to practice interviewing anytime from a computer or mobile device and contains over 7,000 general and industry-specific interview questions. Log-in to Handshake, select Career Center from the toolbar, then Resources. Additional career resources for international students looking to find internship and full-time positions in the US or abroad. While at UCLA, there are various opportunities for graduate students to obtain employment on campus such teaching and research assistantships, as well as reader and tutor positions. To learn more about the types of positions, visit the Graduate Division page. Additionally, many offices and departments offer part-time employment opportunities to students. Log-in to your Handshake account to see on-campus job postings. In general, all F-1 students are eligible for on-campus employment up to 20 hours per week during the academic year and full-time during winter and summer vacation. F-1 students can work on-campus without obtaining employment authorization from DCISS or the US Citizenship and Immigration Services. See DCISS for more detailed information. J-1 students may work on campus part time (up to 20 hours per week) during the academic year. In order to be employed, students must be in good academic standing and obtain on- campus work authorization from DCISS. This includes assistantships (TA, GSR) and fellowships. See DCISS for more detailed information. International students can be eligible to work part-time (up to 20 hours per week) during the academic year and full-time over winter and summer breaks. Below is a brief summary of the employment authorization. See the DCISS website for more detailed instructions and application process. Curricular Practical Training, or CPT, is employment authorization before graduation, which is issued by the educational institution on the Form I-20 (a U.S. government document that verifies a student’s admission to a U.S. institution). Students pursuing unpaid internships are still required to apply for CPT. For more information regarding legal issues around unpaid internships, see NACE article. F-1 students may also use OPT during the summer break but should consult with DCISS to determine if CPT or OPT is needed for their summer position. Cost and Processing Time: There is no cost to the employer. DCISS processes the student’s Academic Training documentation within 10-14 working days. If you are graduating in June and want to work in the U.S. after graduating, please review the information found on the Dashew Center for International Students & Scholars website and be aware of the deadlines. Employers can continue employing international graduates beyond the 12-month OPT period by filing a Petition for a Nonimmigrant (temporary) Worker on behalf of the employee, the most common category being the H-1B visa. Other visa options can be found at the USCIS website. Employment period: Academic training is available both before graduation (Pre-Completion AT) and after graduation (Post-Completion AT). Before graduation, AT is allowed part-time during the academic year and full-time during breaks, or if the student has advanced to candidacy. After graduation, AT is allowed either full-time or part time, but must be for a minimum of 20 hours per week. The total amount of time allowed depends on the duration of the exchange program up to 18 months. Students with Ph.D. degrees may be extended for a total of 36 months. Some J-1 students have a two-year home residency requirement that must be either waived or fulfilled before they can pursue other employment options such as H-1B or Permanent Residency. Cost and Processing Time: There is no cost to the employer. Dashew processes the student’s Academic Training documentation within 10-14 working days. Utilize resources and networks to broaden potential employment opportunities. Going Global is an online database with domestic and international job listings, job search resources, and more. View the H-1B section for a list employers that have sponsored visas by each state and major metro areas. Access through Handshake. USCIS H-1B Cap will allow you to monitor the number of available H-1B visas and provides helpful information. RedBus2US.com provides information and experiences for international students and professionals looking to study, work and live in the US. VisaDoor is a central visa database of employment based green cards, H-1B visa, student visa, immigration attorneys, etc. Vault.com: provides in-depth information on specific industries, company, or profession. Access through Handshake. GoinGlobal: provides information on companies sponsoring H-1B visas, work permit & visa requirements, and job/internship postings. Access through Handshake. Glassdoor: Search job listings, anonymous salary details for any job or company. Lockin Job: Online platform to learn about companies and jobs in China. Don’t apologize for your accent. Work to improve your English skills if you are a non-native speaker but practice your interviewing skills to build your confidence. Emphasize positive aspects of your international background. Certain employers are seeking to expand to global markets. Your international background may be an asset to these employers. Practice, record and get feedback using InterviewStream (access through Handshake) or through mock interviews with a career counselor. Additional career resources for doctoral students for the academic and non-academic job search. In addition to working with your faculty advisor as you prepare for the academic job search market, below are some additional resources to help you. Academic Job Listings is a list of job resources compiled by the UCLA Career Center. ImaginePhD ins an online resource for graduate students in the humanities and social sciences. The Versatile Phd is an online resource for graduate students in all field. HASTAC (“haystack”) is a network of humanists, artists, social scientists and engineers committed to new forms of collaboration across disciplines. My Next Move is a free resource from the US Department of Labor. The following list contains just a few organizations that offer internships for doctoral students. Additionally, many organizations offer internship programs. Visit the websites of organizations that interest you for internship and summer opportunities.